I've been blogging at Away From The Blue since 2011, and during that time have been blessed to share my day to day style through two pregnancies. Clicking through the blog will unearth lots of pregnancy outfit ideas, tips and advice. Available Now in an eBook! How to Have a Stylish Pregnancy on a Budget contains all of that information and more in one simple guide. 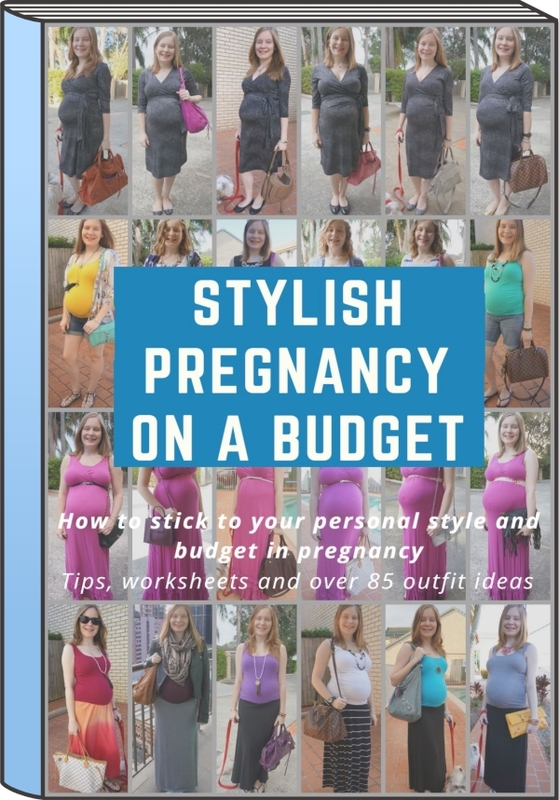 It walks you through how you can stick to your personal style and budget in pregnancy to look and feel great. There are tips, worksheets and over 85 outfit ideas (and yes, some photos that weren't blogged!). Everything you need to have the most stylish pregnancy ever! A process to identify what you have already in your wardrobe that will work for pregnancy. Assistance to develop your own maternity shopping list. A breakdown of all of the different maternity clothes available, what styles you need for different occasions and how to evaluate the options available before you buy. A helpful chapter on how to travel in comfort and style while pregnant. Why you need a pregnancy capsule wardrobe, an example of the possibilities you can create and a worksheet to create your own capsule. Over 85 pregnancy outfit ideas, for all three trimesters. Where to shop to get the best value for money. You can get the ebook here - it's available in PDF form so you can easily print and complete the worksheets. What Kind of Pregnancy Outfits Are In It? A little bit of everything - all three trimesters and all 4 seasons. You'll see corporate maternity style, business casual, evening and special occasion wear as well as stay at home mum running after a toddler outfits. You can check out my favourite second trimester looks and third trimester looks on the blog to give you an idea of some of the stylish pregnancy outfits in the book. Just $2.95. Less than a cup of coffee! Read Shea's review and a little bit about her breastfeeding journey at Shea Lennon. Read Laura's review and how she is planning to stick to her personal style for her current pregnancy, with some wonderful pregnancy style inspiration at I Do DeClaire.